CRC has supported the creation of six AIS Public Service Announcements to be aired in the spring of 2019. However they are available for viewing via the CRC YouTube channel. Here is a one of the PSAs. Lake Mead Mussels clog a plastic pipe. November 23, 2017 - CRC's Leadership in preventing aquatic invasive mussels lands DNRC grant. Check out the Seeley Swan Pathfinder article, "AIS Prevention Grants Awarded" to learn more. November 16, 2017 - Read the Seeley Swan Pathfinder article, "AIS Sampling Ends for the Season - No Mussels Detected." July 20, 2017 - AIS Inspection is critical in helping to prevent the introduction of invasive mussels, however boats could still slip by and launch. What would it take to reach the "gold standard?" Read the recent Seeley Swan Pathfinder article for a view by CRC's Joann Wallenburn to find out. On January 4, the CRC hosted a group of interested homeowners from area lakes to provide updated information on the finding of invasive mussels in Montana and the impact that could have for our lakes. Please read the minutes from the meeting. Aquatic Invasive Species (AIS) are non-native plants, animals, microbes and pathogens that live in the water and when introduced to our waters thrive and out-compete native species, disrupting the ecological balance and causing harm to our rivers, streams, and lakes, and their native dwellers. Montana has already been infested by several AIS, including whirling disease, New Zealand mud snails, and Eurasian Watermilfoil, just to name a few. The waters in our valley are virtually free of all AIS, except whirling disease. 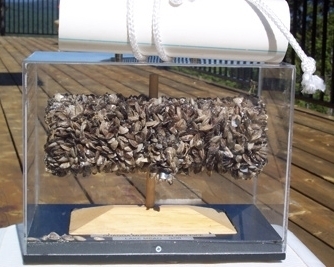 The biggest threat to Montana waters is the Zebra Mussel and its close relative the Quagga Mussel, also known as dreissenid mussels. These animals were transported from their native Black Sea waters in the ballast water of ocean-going vessels to the St. Lawrence seaway and the Great Lakes. They were first discovered in the Great Lakes in 1988. Since that time they have spread to nearly every state in the lower 48. Some eastern seaboard states do not have enough calcium in their waters to support the mussels. In the west, the block of Washington, Oregon, Idaho, Montana, and Wyoming are the only dreissenid mussel-free states. We want to keep it that way. Invasive Eurasian Watermilfoil and Curly Leaf Pondweed have recently been identified in Montana, as close as the Clark Fork River. These and other highly invasive plants are cause for concern as well. What can we do to protect our waters from these invaders? No one wants to harm our waters by introducing an invasive. The more people know about the threat and simple steps to take to protect against transporting an invasive into our valley, the less likely an invasion becomes. CRC works with our neighbors and partners to provide workshops and presentations to the public and the staff who work in our lake-side parks. Montana Fish, Wildlife, and Parks has established mandatory watercraft inspection stations on all major highways coming into the state and at major crossroads within the state. The inspection station at Clearwater Junction (Hwy 200 and Hwy 83) was the busiest in the state, by far. One of the most important and most effective tasks of the inspection staff is outreach and education of all the boaters recreating in Montana waters. Boaters are learning to "Inspect, Clean, Dry" their vessels and gear; and are learning why they want to do so. It is almost inevitable that an invasive species will be introduced in our valley. The best chance we have to eradicate it is to detect it before it is too well established and start removal treatment right away. Hundreds of pairs of eyes are looking at our waters everyday; boaters, anglers, swimmers, divers, skiers... If they can be trained to recognize what plants and what animals belong, they will be more likely to recognize something that is not native - that doesn't belong. In addition to education workshops on topics like aquatic vegetation identification, CRC, with the help of trained "citizen-scientist" volunteers monitors the lakes for the Dreissenid mussels and aquatic invasive plants such as Eurasian Watermilfoil or Curly Leaf Pondweed. Volunteer teams collect samples to be tested for AIS on each of the six (6) major lakes (Alva, Inez, Seeley, Salmon, Placid and Big Sky) four times each summer. Another 16 low-risk lakes in the area are monitored once every three years. If you would like to help with this effort or obtain additional information, please call Joann at (406) 210-8453 or send an email.